Automatic tuning, high-performance scaling unit with turbo boost foot pedal and self contained water source. Self adjusting, automatic tuning ultrasonic technology. Automatically adjusts from 25 to 30k frequency output depending on which type of scaling insert is inserted into the handpiece. Yes, this unit will work with both 25K and 30K scaling inserts. Any brand any manufacture – all “Cavitron” type magnetostrictive scaling inserts will work in our unit. No need to replace or throw out your older inserts. Fully self contained water source. No extra installation or hook ups are required this unit does not require any air or water source. The Beaver Elite is equipped with its own internal pump that pumps the water through the handpiece to the tip. This feature makes this unit ideal for mobile dentistry and moving the unit from operatory to operatory. 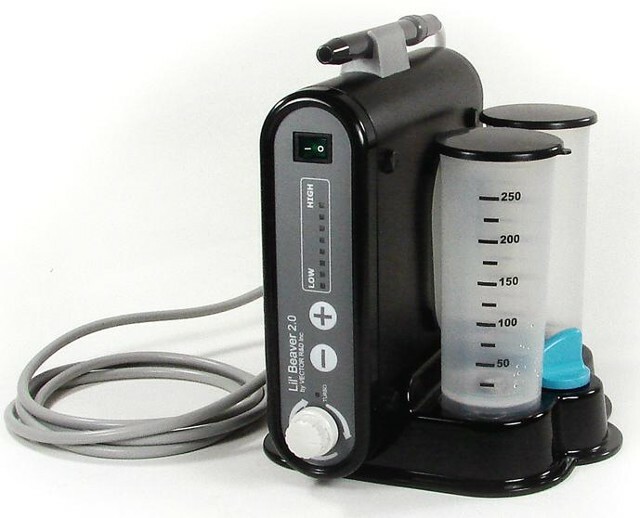 Removable bottle allows for quick and easy refill with clean sterile water or if desired you can add any special irrigant or solution to the bottle for added scaling effectiveness. Purchase spare bottles and quickly switch from water to your solution by simply switching the bottles. 1 year warranty on unit, 6 month warranty on foot pedal and handpiece. Turbo Boost 2 position foot pedal. Press lightly to begin scaling at the power set on the dial. While scaling, when you encounter a heavier spot of calculus simply press more firmly and the unit jumps the power up to tackle the more difficult tenacious calculus. The foot pedal does the adjustment so there is no need to stop scaling or set down the handpiece to adjust the power dial or press a turbo button on the front of the unit. Unit comes complete with all attachments needed for installation and use.